Click the button below to add the LOX WOOD to your wish list. 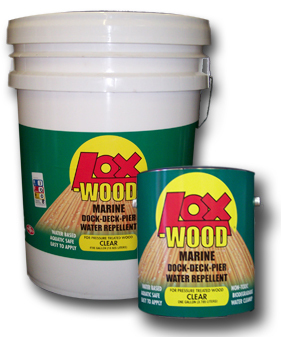 PRODUCT DESCRIPTION: LOX-WOOD Marine Dock, Deck and Pier Water Repellent is a long lasting polymeric wax emulsion. The composition is free from toxic, hazardous and flammable materials. It is designed to protect wood surfaces from the damaging effects of water absorption. Surfaces treated with LOX-WOOD will have a significant decrease in checking, cracking and spearing. Properly treated surfaces will also be less prone to mildew and algae growth on the film surface. The composition is environmentally safe, including application over aquatic environments. The product is fungicide and solvent free. Although this product is specifically designed for pressure treated wood, it may also be used on other aged wood surfaces. Do not apply to new cedar and redwood. SURFACES: Yellow pine, spruce and fir wood substrates. new and old pressure treated wood, previously stained wood. Also excellent over OSB (Oriented Strand Board) and plywood used for roofing and floor decking to reduce wood swelling from rain during construction. It is not recommended for new high tannin containing woods such as Cedar or Redwood. DRY TIME: Generally 30 to 90 minutes, depending on humidity and temperature. Surface is ready for foot traffic when dry and non-tacky. NOTE: Above properties determined at 77 Deg F / 50% Relative Humidity. APPLICATION: Apply with pump up garden sprayer, airless sprayer, paint pad brush or roller. When spraying, be sure to remove puddles with brush, roller or paint pad. Excessive application or puddles may leave a cloudy film on curing and will result in excessive dry times. Maintain a wet edge by coating boards from one end to the other. When spraying, immediately back brush, roll or wipe with an applicator pad to insure uniform coverage. A second coat may be applied after initial coat is dry to walk on. One even generous wet coat is normally sufficient on new wood. Two coats are recommended on older more porous wood. Do not allow product to puddle. Additional thin coats may be applied as needed at a future date. When water beading ceases due to weathering, simply re-apply a thin coat. New Pressure treated wood: Allow to age a minimum of 30 days. Some pressure treated woods exude preservative chemical salts. These must be removed through cleaning or allowing the wood to age until the chemical salts stop exuding to the surface. In order to insure that LOX-WOOD will penetrate properly, apply a small amount of water to the surface. If the surface absorbs the water, it is ready for treatment. If the surface still beads water, allow it to age until water evenly wets the surface. LOX-WOOD may be applied to damp surfaces. Old Pressure Treated Wood: Clean thoroughly by power washing with or without cleaning chemicals when working over an aquatic environment. Use only marine safe biodegradable chemical cleaners if desired for removal of surface contaminants. On wood surfaces over ground, pre-wet substrate with a mixture of 1 part household bleach to 4 parts water using a pump up plastic garden sprayer. Then power wash, not exceeding 1500 p.s.i. Protect vegetation by wetting thoroughly and covering with clear plastic drop cloths. Remove immediately after bleach application before power washing the surface. It is advisable to re-wet sensitive areas during the power wash procedure. Previously Stained Surfaces: LOX-WOOD can be used over sound stained surfaces that have lost water repellency due to weathering. A thin coat can extend the service life of the existing finish by reducing water absorption and further surface erosion. Apply a small amount of water to the surface. If the wood darkens and does not bead water, indicating water penetration, it is ready for treatment. If the water still beads and the wood does not darken, allow to age until water evenly wets the surface. Remove dirt, grease and any surface contamination with a mild detergent cleaning solution. Then rinse thoroughly and let surface dry before LOX-WOOD application. Pre-stained Horizontal or Vertical Surfaces: If the surfaces are in sound condition but lack water repellency and absorb water readily, a diluted coat of LOX-WOOD can be applied to extend service life. Product can be diluted with 1 to 2 parts water. Apply a small sample to determine which dilution level provides water beading when dried overnight. When beading is lost due to weathering, additional coats may be applied at any time. THINNING: Normally not required with the exception for vertical surfaces. CLEANUP: Soap and water. Since this product does not contain toxic or hazardous material standard waste disposal methods are acceptable.